and is the avalanche joseki. If Black plays and here, then we get the large avalanche. 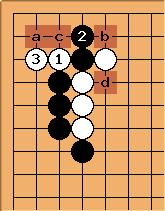 If either player wants to avoid these complications, White can play at a or play tenuki (move elsewhere) with , or Black can play at a or b with . These are described in large avalanche simple variations. In the large avalanche, , , and are all forced. 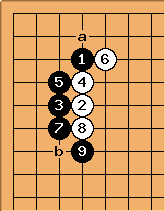 Next, Black can choose amongst a, b and c. Here a is the oldest variation, b is newer and c is most modern, having been introduced by Go Seigen in a game against Takagawa Kaku in 1957. Nowadays, the turn inward at c is the most popular variation, while the turn outward at b is also still played often. The cut at d is a recent development.